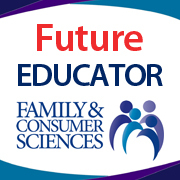 Commit to Becoming a Family & Consumer Sciences Educator! We want you to "Say Yes to FCS"! - There is a huge demand for family and consumer sciences educators in secondary schools, Extension, and higher education. If you're ready to pursue a career in family and consumer sciences education (or you already are), show your commitment by completing our short online form (click on "Commit Now!). Your commitment will then be seen on our "Say Yes to FCS" interactive map below. Commit Now! Say Yes to FCS! Share your commitment on social media!